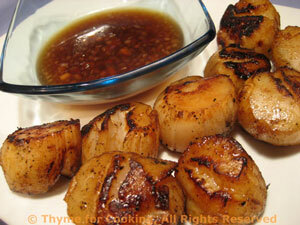 Grilled Scallops with Lemon Ginger Sauce, quick, easy gourmet dinner. We use a bit of ginger all summer, so if you have to buy a larger piece for the scallops, don't worry; it'll keep for several weeks. No scallops? Substitute shrimp, cooked the same way. 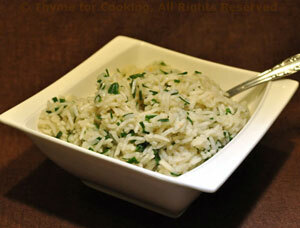 The lemon makes a very refreshing, light rice side dish. The fresh chives add just a hint of onion. Add stock, cover and cook until done, about 15 minutes. Add chives, lemon juice and olive oil. Stir gently with a fork to combine. Serve. Ginger and sugar pair well with carrot's natural sweetness.... The ginger giving an extra kick to the butter and sugar glaze. 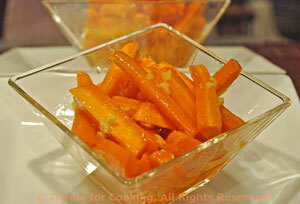 Cut carrots into sticks. (see techniques). In a medium nonstick skillet melt the butter over medium heat. Add carrots, ginger, and sugar, (salt & pepper if using). Stir fry for 2 minutes. Add just enough water to barely cover the carrots, turn the heat to medium-high, cover and bring to a boil. Remove cover and cook, stirring occasionally until water is gone, 6 - 8 minutes. Cook another minute or 2 after water evaporates to caramelize the sugar.